In today's bizarre piece "Raw deal: Obama ditches trade for health", the writers start off with "It appears the Obama administration is sacrificing free trade for health care." "...For centuries England has relied on protection, has carried it to extremes, and has obtained satisfactory results from it. There is no doubt that it is to this system that it owes its present strength. After two centuries, England has found it convenient to adopt free trade because it thinks that protection can no longer offer it anything. 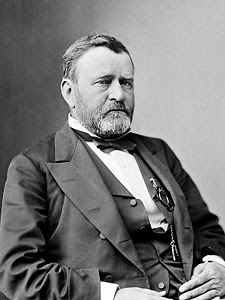 Very well then, gentlemen, my knowledge of our country leads me to believe that within two hundred years, when America has gotten out of protection all that it can offer, it too will adopt free trade." 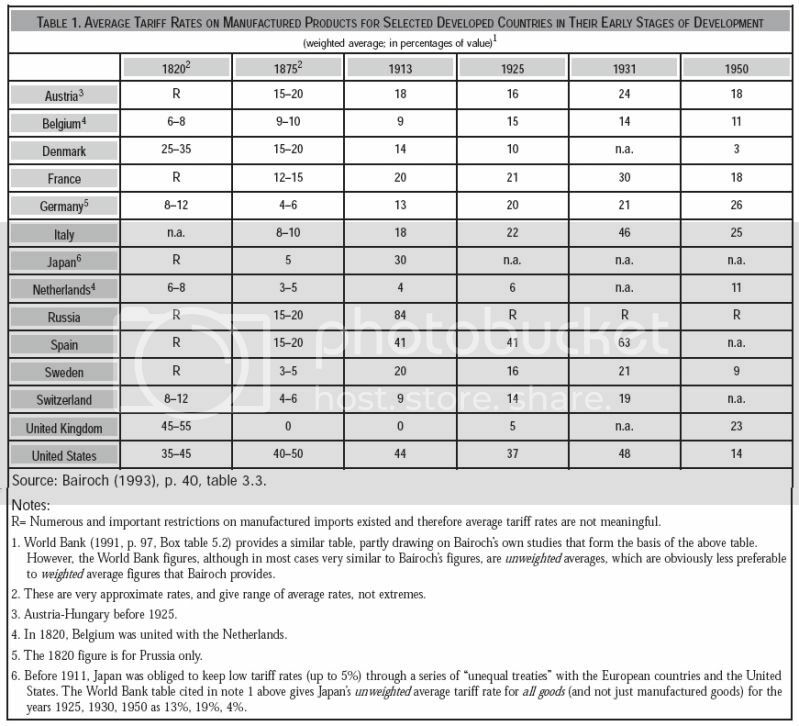 And to support my statement of "rivaled only by The United States and a few other now well-off countries in the 19th and 20th centuries", here is a chart "Average tariff rates on manufactured products for selected developed countries in their early stages of development". That shows how countries who use subsidies and tariffs, and are not forced into free-trade until they are ready are the ones that succeed. So back to the bizarre introductory statement. At first, I was hopeful that the editors for some reason were going to say something useful. Instead, their statement reads more like "tooth-brushers sacrificing toothpaste for clean healthy teeth". "If the self-proclaimed 'free traders,' who dominate the economics profession and policy debates, actually were free traders, they would be pushing hard to allow people in the United States to benefit from international trade in medical services in the same way that US consumers have benefited from low cost imports of cars and clothes. There are several obvious paths through which the United States could gain by freer trade in health care. First, we could construct trade deals that simplify the process through which foreigners can train to meet US standards for becoming doctors, dentists, and other highly paid medical specialists. An even simpler route for gaining from trade would be to allow Medicare beneficiaries in the United States to buy into the much cheaper health care systems in other countries. The government could split the savings with the beneficiaries, allowing them to pocket thousands of dollars a year, while saving the government the same amount. The receiving country could even get a premium over its costs in order to give it an incentive to take part in the program. Finally, the government could try to standardize rules around the rapidly growing industry of medical tourism. Every year, tens of thousands of patients travel to Thailand, India, and other countries to have major medical procedures performed at prices that are often less than one-tenth as much as those in the United States. The savings can easily offset the cost of travel for the patient and several family members. If facilities were regulated and clear rules established for legal liability, then more patients would be able to take advantage of the potential cost saving. However, the free traders are not interested in promoting free trade in health care. They would rather just tell us that there is nothing that can be done about exploding health care costs in the United States. This might have something to do with the fact that the primary beneficiaries of protectionism in health care are doctors and dentists, not autoworkers and steel workers (and the drug and medical supply industry)." For a second there, I thought the brilliant Oklahoman editorial guys were going to say something sensible like this, instead they are trying to prove Ulysses S. Grant correct that we are nothing but the disgraceful hypocrites that the British were in his days. The Editorial staff rants and raves about Democrats suppressing "Free Trade" agreements with Panama and Colombia (something that will only upset a handful of Americans) and quote a foolish statement from "The Hill" newspaper "Now the administration is backing away (from free trade policies), fearing a messy intramural fight over trade could spoil efforts to pass health care by summer’s end." My guess is that they found this quote after browsing their scholarly piece "50 Most Beautiful People on Capitol Hill 2008". The Oklahoman writers go on to discuss some things Ron Kirk says about the matter, and it isn't surprising. Kirk's appointment by Obama as Trade Representative was almost as disgraceful as the appointments of Penny Pritzker, Larry Summers, and Robert Rubin. Folks the editors can get along with since their interests are only in the wealthy and not the working class who make the country great, and are victimized by things like so-called "Free Trade Agreements". And no, it isn't just "Big Labor" who is against these things, as they say in this idiotic piece. But the bottom line on so-called Free Trade is that almost everyone outside of millionaires and billionaires in our country are against it, and it is disgraceful to tell countries that they can't grow in the same fashion as we did, and as did other successful countries. There are almost none that have prospered free from strong tariffs and subsidies, watch the Ha-Joon Chang video on the right to learn more about this stuff, things like Alexander Hamilton's "Infant Industry" theories (that we practiced countless times) on bringing up your countries industry through tariffs and subsides until it can operate on it's own, something the editors at The Oklahoman want to deny struggling countries like Colombia and Panama so that Ed Kelley and J.E McReynolds can continue to get cheap taco salads at Taco Bell.